We should never forget that the horse is an incredibly generous creature, who has allowed us to sit on his back for many centuries but was not necessarily designed for this purpose. In a natural environment the horse is a prey and therefore flight animal and the most important factor ensuring his survival is the ability to run. By sitting on his back we humans are compromising part of his locomotor apparatus, i.e. many of the muscles that produce movement. As riders we are not even content with simple movement, such as walk, trot or canter in straight lines. We want the horse to perform every movement he is naturally capable of, but at a time and for a period of our choosing, while we incumber him with our bodyweight! A saddle is not natural to a horse, but as we want to ride our horses and it helps us to ride better, it’s a good idea to use one. Only, I think it should be as UNOBTRUSIVE as possible! It should CONNECT horse and rider, not act as a barrier. It should allow total COMMUNICATION. Our aids to the horse are the major part of this communication and the saddle should allow us to apply them WITH LIGHTNESS. This is only possible if we are close to the horse. Anything that takes us away from his back and puts our centre of mass higher will hinder and destabilise. Since both horse and rider are flexible, the saddle should flex with them, while still protecting the horse in areas of concentrated pressure, i.e. girth and stirrup bar attachment points. A saddle without a tree will flex but stirrup bar pressure can be a problem. A saddle with a rigid tree will protect the horse but also hinder him with its rigidity, frequently creating other pressure points. The flexible tree of the Strada saddle therefore seems to me to be the best solution. The fact that it comes in different BODY TYPES, rather than just widths, ensures greater congruity between tree and back and therefore gives better weight distribution. This is further enhanced by the heat- and pressure-sensitive foam used in the panels, which moulds itself to the horse in the same way that a “memory foam” mattress moulds itself to our contours. Of course, the rider must also be comfortable, otherwise he/she will not be able to communicate clearly and lightly with the horse. Since I regard a saddle as a tool, not an armchair, I believe that rider comfort does not depend on the presence or absence of large amounts of padding. It depends on the rider being able to sit RELAXED, with the leg hanging naturally and the pelvis in a position of his or her CHOOSING. The open seat and neutral positioning of the stirrup bar of a Strada saddle allow this to happen. 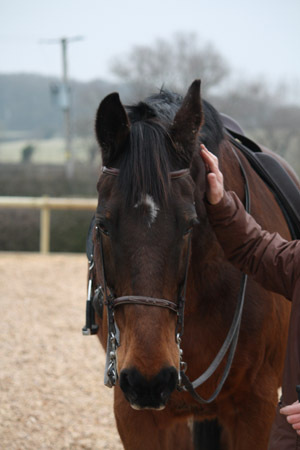 The rider can sit with ease, rather than having to sit in a position dictated by the saddle and is therefore comfortable. Since, in the partnership of man and horse nature gave the horse greater strength, but man greater intellectual capacity, I believe it is our DUTY to do everything we can to enable the horse to do what we ask of him WITH EASE and IN COMFORT. This will not only ensure the horse’s welfare, but also maximise his performance, therefore giving competitive riders an advantage. When choosing a saddle both horse and rider must be considered. A saddle must fit both, but I believe that all too often the rider’s preferences, occasionally even quirks of fashion take priority over the true comfort of the horse. I feel very strongly that this is wrong: The rider can adapt to some extent, THE HORSE CANNOT. He is a given type and shape. He is the athlete who works for our enjoyment. HE MUST COME FIRST. Ilga Cottle, Director, Strada Saddles UK Ltd.